If you are running Adsense in your website, you are in a way providing a service to your advertiser. And by definition of Indian laws, service tax needs to be charged for every advertisement displayed on your site. Online advertising was except from this tax earlier, but effective Oct 1st 2014, the exception is removed and service tax is applicable. This leaves a lot of confusion for every Indian blog or website owner who use Adsense for monetization. Do we need to pay service tax? Ho should we calculate it? Should we register for service tax ... well the good news is that nothing needs to be done. If an advertiser is using your ad space and paying you directly for it, you are responsible for collecting service tax from the advertiser. But with Adsense, the service provider is Adsense and all the INDIAN advertisers whose ads show up on your site are the customers. That means from 1st October 2014, Adsense needs to collect 12.36% extra from all INDIAN advertisers. 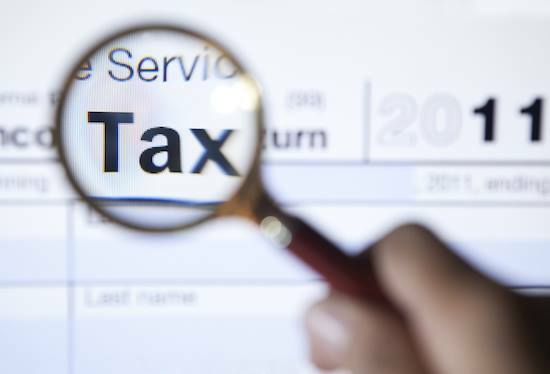 Is the new service tax good or bad for me? As a blog owner, you will definitely be relieved. But think about it- are you winning? If a big chunk of your site traffic is from outside India, then yes you are immune to the new service tax. But if you depend more on Indian advertisers, chances are your Adsense revenue will show a dip starting Oct 1. Just because there is a new service tax doesn't mean all advertisers are going to raise their ad budgets. They would bid the same as they used to earlier, but Adsense would be counting 12.36% of each click revenue as service tax. Should ads on my site be exempt if income is less than ₹10L? Take everything you can, give nothing back. Its applicable from 1st October 2014, not 2015. Would Google give us a certificate for service tax? or for deducted service tax? Whose responsibility it would be to pay service tax? Google or publisher? It is Google's responsibility as a service provider to collect and pay service tax from it's advertisers. Since a publisher does not come under the definition of service provider, no need to worry about anything. Yo I knew, They are collecting 12.36% of the entire ad cost from Indian advertisers. Even Bing sent such a mail! We need proof that Google has paid in our behalf now that publishers are not exempt from service tax ( as partners in ad serving business). [But there is also other way of looking as my accountant advises. We receive in USD & our contracting entity is Google Singapore. We are serving a foreign entity and it is export(as per place of provision rules). In this case we are however completely exempt of service tax.] Its all HAZY! Waiting for more discussion from all publishers! Suppose, Google pays service tax to Government, should still i need to get service tax registration number and pay service tax on total revenue? As of now, the understanding is that website owners are not considered service providers. Only adsense is treated as service provider. So Google is not paying service tax on the website owner's behalf, but as a service provider themself. As per last info, website owners are not needed to get any registration number or pay service tax. I'm still confuse. My tax adviser suggest me to register for service tax number. What to do? I have 100% money from Google AdSense and i earned almost more than 100K per year. Should I wait for Google to get Canvat certificate or wait for service tax warning notice? This is not a clear answer for my query. 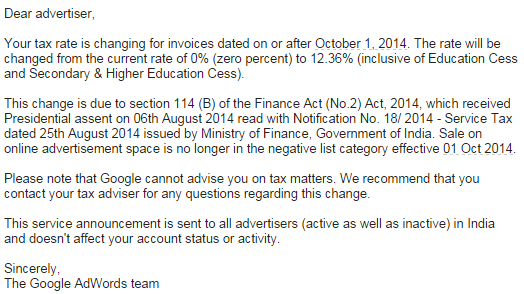 Google is deducting money from Advert's account with service tax. So, in this case, Google is already paying service tax to indian government behalf of us. Should we still register service tax number and pay 12.36% on full revenue. I earned 50 Lakh from Google AdSense between 1April to 31 September. In this case, I would have to pay service tax around 618000 on full revenue. Please advice me a right thing. I heard that If i would make late decision, I would have to pay 24% with interest service tax. I waited a long time for clarification, can somebody tell me the truth about service tax liability? I am earning more than 10 Lakhs per month from AdSense in india per year and paying income tax. How service tax is going to be charged on ads shown via adsense in Indian websites.